Baltic amber was formed over the course of 45 million years, from fossilized pine tree resin that grew in Northern Europe to Scandinavia. When the climate in that region began to get warmer, the pine trees produced resin or sap. this eventually fossilized and became hard and stable through oxidation. 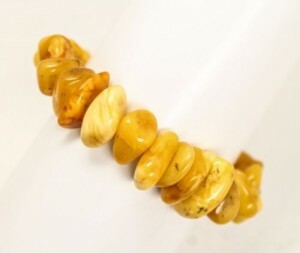 Authentic Baltic amber contains succinic acid, which works like ibuprofen when worn against the skin, and produces a soothing smell when in burned or in contact with human skin oils. Baltic Amber has also been said to help with pain relief, inflammation reduction, and energy restoration. In Europe, Baltic amber is commonly known as “teething jewelry,” due to its pain-relieving properties. It also is said to help with joint pain when worn near the site of pain. There is a legend, according to Lithuanian mythology, about where Baltic amber comes from: The goddess Jurate, daughter of Perkunas, the god of thunder, lived in an amber palace in the Baltic Sea. A fisherman named Kastytis chose to cast his nets near Jurate’s amber palace, so Jurate set her servants to tell Kastytis that fishing there was forbidden. Kastytis kept fishing anyway, so Jurate went to confront him herself. Of course, upon meeting him in person, Jurate fell madly in love with Kastytis and brought him to live with her in her amber palace, even though she was already betrothed to another god. When he heard that his daughter was living with a mortal, Perkunas was furious. In his anger, he destroyed the amber palace by sending a lightning bolt into it, which killed Kastytis. Jurate remained chained to the palace’s ruins for all eternity. It is said now that when there is a storm in the Baltic Sea, pieces of Jurate’s amber palace wash up on shore. Some pieces are teardrop shaped -they are said to be Jurate’s tears from crying for her lost love. Whether you choose to wear Baltic amber for its healing properties, or for its tragic place in Lithuanian mythology, Baltic amber makes a wonderful timeless accessory, 45 million years in the making. 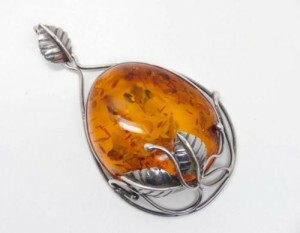 To shop for some of our amber pieces, click here.